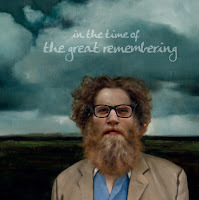 It's time for everyone to get excited about In the Time of Great Remembering, the forthcoming album from Ben Caplan & the Casual Smokers. The record, out October 18th, is an extremely compelling collection of story songs from the Halifax-based musician. Whether it's medieval knight's tales in wandering minstrel style, like "Southbound", confessions of a bad lover like "Drift Apart", or all out lilting murder ballads such as "Stranger", it's next to impossible to stop listening to Caplan spin his yarns. The most obvious comparison though, is to the usually incomparable Tom Waits. Caplan's vocals often mimic the mouthful-of-bourbon-soaked-cotton-balls growl of Waits. His lyrics are often mischievous, maniacal, and nonsensical, much like Waits. The affection of clatter and allusions to the devil on "Conduit" do nothing to dissuade the comparison, nor do the jazz and spoken word elements of "Bang To Break the Drum". The deep-South spiritual style of "Down To the River", evokes thoughts of another ominous singer, Nick Cave. That comes across again with "Leave Me Longing", the deeper, more restrained vocal approach encroaching on Cave's The Boatman's Call territory. Waits and Cave are two comparisons that I try to use very sparingly. Few artists can truly hold up to the scrutiny that comes with that. However, on In the Time of Great Remembering, Ben Caplan shows himself to be a capable kindred spirit. Ben Caplan & the Casual Smokers play Mitzi's Sister in Toronto on September 12th. Best tracks: "Bang To Break the Drum", "Seed of Love"